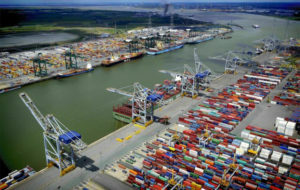 The port of Antwerp plans to invest EUR 1.4 mln over the next 3 years in projects aimed at making port-generated freight traffic smoother and more efficient. The 7 private-sector projects that were selected for financial support on the basis of a Call for Proposals issued by the Port Authority in the beginning of 2017, will all together reduce the number of truck trips by up to 250,000 annually, informs the port’s press service. The submitted projects were assessed on the basis of various criteria, such as a profitable business plan and whether they offered a reliable and price-competitive alternative to existing, less sustainable solutions. Each of the ultimately selected projects can count on a support amounting to EUR 200,000 spread over a period of 3 years. All the winning projects aim at further developing intermodal services. Thus, DP World, a leading container terminal operator at the port, which operates Antwerp Gateway, plans to enhance its rail services and targets at raising the share of rail transport in its operations to 10% by the year 2020. DP World plans to attract a new service to Stuttgart offering a sustainable transport alternative for the German car industry. Two other rail projects were presented by Euroports Inland Terminals, a member of the Euroports Group, and Slovak Shipping and Ports, a container terminal operator from Bratislava, Slovakia. Euroports introduced a new direct rail service between the port of Antwerp and Liège, which will run twice a week starting from January 2018. The Slovak company will start operating combined trains – a mix of intermodal and conventional railcars – between the terminal in Bratislava and the port of Antwerp in the second half of 2018. Starting from two times per week, the frequency will later be increased to four trains per week, providing an efficient direct rail link to the eastern European hinterland. Other projects aim at developing barge services, like, for instance, the multimodal logistics service provider Delcatrans, which is developing a reefer platform at its River Terminal in Wielsbeke to ship deep-frozen vegetables and potato products from Flanders by barge transport. West Flanders is an important European hub for the deepfreeze industry products that are sent via Antwerp to destinations all over the world. Danser, one of the largest intermodal operators in Europe, offers to set up a hub-and-spoke concept along the Brussels-Scheldt canal and also introduces a corridor system between northern France and Antwerp. The Dutch Port-Liner Holding, specialising in building “zero emission” barges, suggests an innovative barge concept. The company plans to construct 5 hybrid barges that will ply between De Kempen intermodal terminal in South Netherland and Antwerp. An interesting project was submitted by Hakka NV, a company operating a digital platform for the truck industry. Hakka presented an application that finds return loads for trucks, thus avoiding empty trips and making truck transport more efficient. The Flemish government has announced that it will join the Antwerp Port Authority’s Call for Proposals and within the next few months will release a further EUR 1.4 mln for projects to make transport in and around Antwerp more sustainable.